The State Weed List is designated by the Washington State Noxious Weed Control Board. Each County Weed Board has the flexibility to address local weed control priorities. Developing annual county lists from the State Class A and B designates and then choosing from the rest of the State B & C lists can most effectively target weed invasions on a local level. The public weed hearing for creating the County’s weed list is usually held in January, allowing time for the list to be submitted to the state. By controlling noxious weeds landowners protect life and health, improve habitat for fish and wildlife, maintain native plant communities and minimize the impacts to agriculture production. All state listed noxious weeds are non-native plants that have been introduced to Washington through human actions. County field staff are available for community education programs and consultations with land owners to discuss weed management options including measures to prevent the establishment of noxious weeds on their own property. 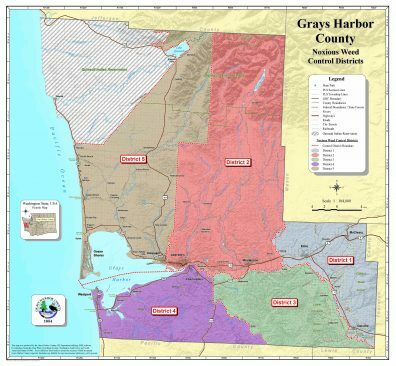 The link to Grays Harbor 2018 Weed List is here: 2018 Final.